IM Odondoo Ganbold is champion this time in Tuesday Night Marathon scoring 6.5 out of 8. Today in the 8th and final round he defeated Hans Niemann. I defeated National Master Russell Wong to be jointly runner up with IM Elliott, Steven Gaffagan, Sergei Ostrovosky. In the second board of last round, Hayk was in a better position against Steven Gaffagan as far as I last saw. But they drew and hence Hayk despite being top seed ended after half a point behind us. 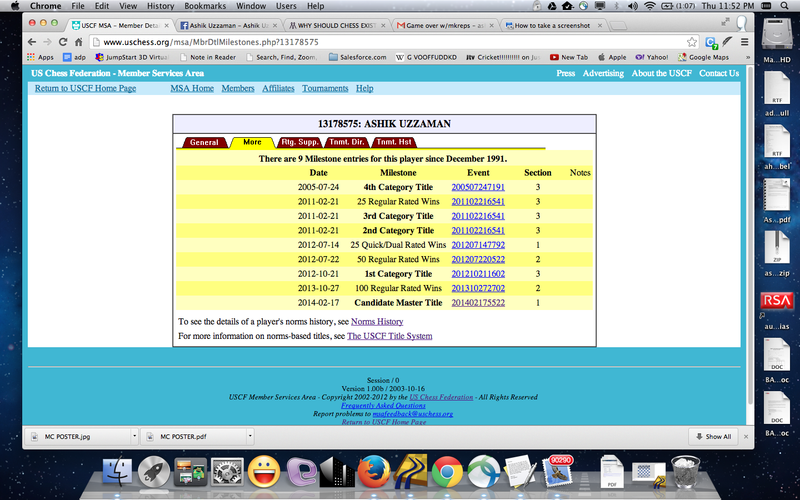 Here is the final standings - http://www.uschess.org/msa/XtblMain.php?201402258372 It shows my post event rating as 2147! One very satisfactory thing is the complement I recieved in the current newsletter of Mechanics Chess Institute from IM John Donaldson. Grand Master Maurice Ashley recently asked in a facebook post, what can be done to make Chess dramatically more exciting to the audience and followers, not only to players? As he is working with MIT Lab on this, his plan is to implement some of those in the upcoming Millionaire Chess Tournament at Las Vegas this October. Being a chess player, commentator, parent / audience I have thought many things at different times around this. Here are some that are coming to my mind. I think point#9 below, bringing chess statistics in front of general audience is the most important of this bunch. Chess players and their parents should be able to know each round's pairing real-time (as soon as the paring is done). This can be easily done by posting the pairing not only on a physical wall or tournament board but also online at tournament website as well as texted/emailed to the participants and tweeted to through a specific hashtag for an event. This will be very convenient for the players and equally convenient for the audience who can quickly check the pairings or board numbers of their favorite players as well as current standings. Let the audience watch the games live. Traditionally we have been using standing boards and now-a-days big tournaments arrange DGT boards or e-boards. These should also be broadcasted online, like Monroi does through its server. Let the audience guess the moves that are going to be played over the board shortly on the games that they are following. If the audience can watch the game real-time, they will often make attempt to guess moves at each step of the games that they are following. Just make it more fun by recognizing the top number of correct guesses from the audience and give some incentive for it probably in the form of a token prize. Let the audience share and participate on discussions or chats about particular games or about the whole tournament at real-time amongst themselves. This is similar to live chat comments by the players that we see in online broadcasted tournaments. The audience will get a common interest group. For example, ask the audience to vote on what was the winner's playing style on board#1 that matches with a world chess champion of present or past? Does his game resembled Capablanca's style or Tal's? Find a similar game or move from history. Announce best game of the day in each sections. Probably pick 5 from each sections and let the audience vote, so by next morning you have winners. Let the top players spend some time after the game in question & answer sessions with audience and journalists. Use live commentators on top boards who should be able to take questions from audience sitting in front of them as well as from email, sms, tweets or chat. The commentators should not only be giving oral description of the games but also should be updating the tournament events page or tweeting the info. Introduce the star fobia on audience in each sections. Bounty and Bounty Hunter concept of Millionaire Chess will be very effective in this regard. Similar to what we say in Cricket, Sachin Tendulkar has made 100 centuries in international cricket or Roger Federer won 17 Grand Slams in tennis. So we can say Nakamura won 53 classical chess games (a fictitious number I just made up) in Kings Indian Defence, highest amongst the contemporary chess players who are rated at least 2400 or above. This exact position in Game Z has occurred 135 times in the past according to ChessBase or this typical combination has been carried out 37 times in the past according to ChessBase. Use state flags or country flags for each top players in every section (if not all players) in their tables. This way audience will start supporting players whom they don't know, only based on the flags that they carry. Make player profiles available in the tournament web site for all higher rated chess players. I just checked a little earlier my USCF page and see that I have earned USCF Candidate Master Title which is also known as USCF Expert Title. I crossed 2000 USCF rating in February supplement of USCF rating but I had 4 candidate master norms till then. But the title needs both 2000 USCF rating and 5 Candidate Master norm / performances. So the final and 5th norm was filled up by my perfect score of 6 out of 6 at Ameteur Team West Championship last weekend. Changed my Chess Blog Address from "Chess For You" to "Dragon Bishop"
I have recently changed my blog address from Chess For You to Dragon Bishop. So my previous URL http://chess4you.blogspot.com is no more available. Instead please use http://dragonbishop.blogspot.com . I love Sicillian Dragon opening as White primarily because of the enormous power and potential of the dragon bishop. That's why when i was looking for a more meaningful name for my chess blog, I decided on this. 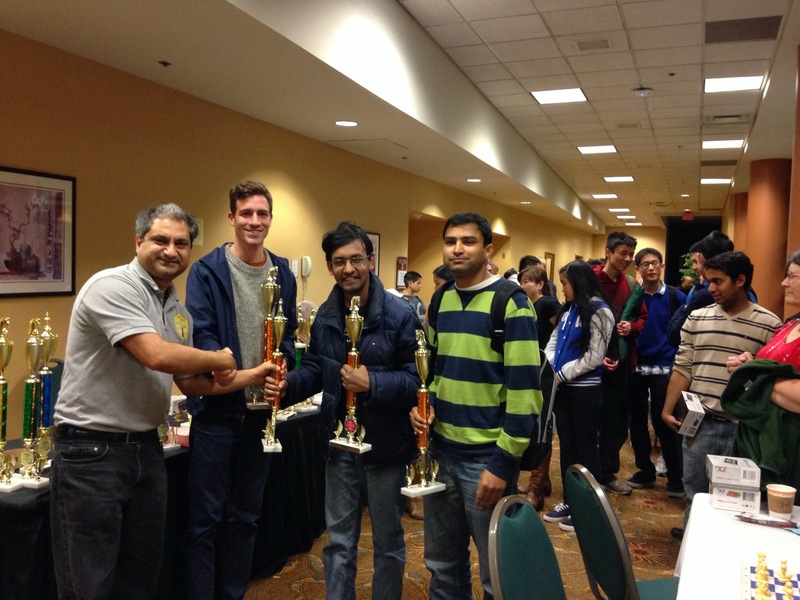 This Presiden't Day weekend, Salesforce Chess Club represented Salesforce.com in US Ameteur Team West Championship 2014 at Santa Clara Convention Center, Great America Pkwy. Here was our team composition. Being a new team, we scored 1 out of 6 rounds but received the trophies for representing industry in the tournament. I won all my 6 games thus receiving a foldable chess clock for top performance on board 1. If you want to look at those games they are given below. My rating performance for this tournament is close to 2500 due to perfect score, taking my new rating up to 2089 for March supplement. But I myself am particularly happy to play the 30th move of Game 3rd. NorCal House of Chess became champion this year. They were the champion previous year too. The top board was GM Enrico Sevilliano, 2nd board IM Reciardo Du Guzaman and 2rd board IM Ronald Cusi. 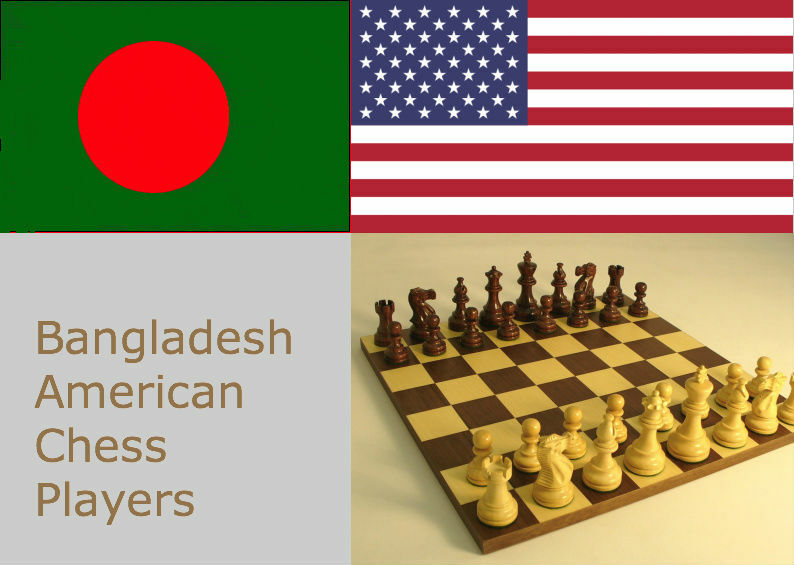 Interesting was 4th board, my fellow Bangladeshi chess player Shafieen who is also a student of Coach Ted of NorCal House of Chess. Shafieen got a very good exposure with this tournament playing in the same team with GM and IMs. Way to go for him. Mechanics Newsletter has put the next but last position of this game in their current newsletter as a puzzle. After making move 23 my opponent forwarded his hand, a gesture that i took as if he resigned. So we stopped the clock and were talking about how i blundered a piece. After a while when he saw i wrote 1-0 in my scoresheet, he said he offerred me a draw! I said why would i take a draw when it is completely winning for me. So we setup the pieces again and continued from here. He eventually resigned not long after. Can you find black's next move here? I am very proud of executing this move over the board against an opponent of my equal strength! This game has been featured in current CalChess Journal at page 10. You can replay the full game below. My opponent had a good game against me but was low on clock time. As a result of time pressure he made a blunder at the end resulting in a mating attack. Ahyan Zaman and Shafieen Ibrahim featured in this week's Millionaire Chess Open newsletter (#7) as young participants! Ahyan is the youngest by far to register while Shafieen was the first teenager to register for this upcoming high stake chess tournament. Here is an excerpt from the post in website. Ahyan, only 7 years old, started playing chess about a year and a half ago and has a great passion for the game. His father, Ashik, signed him up for the Millionaire Chess Open to gain the valuable experience of what it feels like to be part of a major tournament, and to learn how to conduct himself under those particular playing conditions. 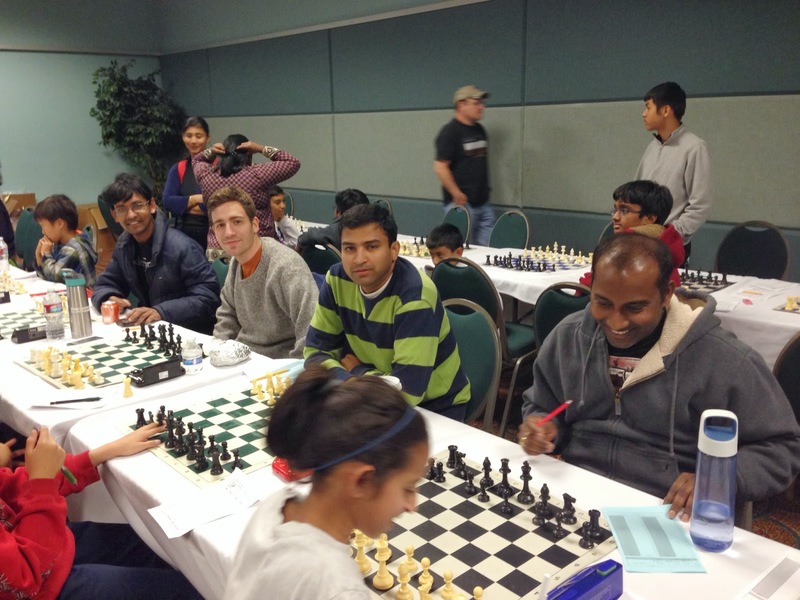 Being a chess player himself, Ashik felt that such a big tournament can truly inspire everyone to work hard, enjoy chess, and improve one’s game. "We father and son are already looking forward to be bounty hunters in our respective sections!" Ahyan’s mother and 3-year-old sister will be joining him and his father in Las Vegas, making it a vacation for the whole family. We’re sure they’ll have plenty to keep them busy as they explore the LINQ Project and watch their two favorite guys compete for the top prizes at the Millionaire Chess Open! Following last week's tough save, today I defended another apparently lost game against Hayk Manvelyan who routinely becomes champion when he participates in Mechanics Chess Tournaments. His this month's rating is 2344 while mine is 2022 - a huge 322 rating points difference. He didn't play the last cycle of Tuesday Night marathon and hence I got a chance to be runner up. I was trying to prepare against him last night but I saw that he doesn't play any particular opening and simply thinks out something sharp, out of normal book lines instantly over the board. This is why I like following his games. So I gave up preparing against him and thought I will simply play the position that arises on the board. Remembering my recent 26 move defeat to him, I was not hopeful though. He replied my e4 with Sicillian and I went to Grand Prix Attack. I made an unnecessary aggressive move of knight in the opening followed by an oversight to loose a pawn very quickly. But I kept the initiative as in this line White is ready to sacrifice several pawns to continue the attack. Slowly he became 3 pawns up although I could recover a pawn any time and I had some compensation for the other 2 pawns but not enough. However, slowly I first regained one pawn and then out of the 2 pawns, Hayk gave me back one pawn to neutralize my initiative. This way he ended up being one solid pawn up. However, I found a tactics with my knight that wiped out all the pieces off the board leaving only the queen and a knight each side with Hayk still being one passed pawn up. However, as it happens in such positions, you can't queen your passed pawn because your opponent will get a perpetual check to your King. This is exactly what happened. Hayk waited until he had 14 seconds left in his clock before forcing draw by repetition. When I submitted the scoresheet, Mechanics Chess Institute Director IM John Donaldson said that - Ashik, considering your recent outstanding performances, FIDE wants me to do a Drug Test on you to make sure you are within fair play boundary! We all laughed at it loudly. Carlsen miraculously escaped defeat in Nakamura's hand keeping his undefeated record against Nakamura in classical games. I didn't play the first round and because Ahayn is playing and I have to drop him, so I started playing the marathon from second round.